Sabri (centre) inspecting the recovered stolen motorcycles at Bau district police headquarters (IPD) yesterday, while Ali (left), Mahadir (second left), Damataries (second right) and Benedict look on. BAU: Bau district police have busted four robbery, vehicle and motorcycle theft gangs operating in the southern region and arrested their respective masterminds. 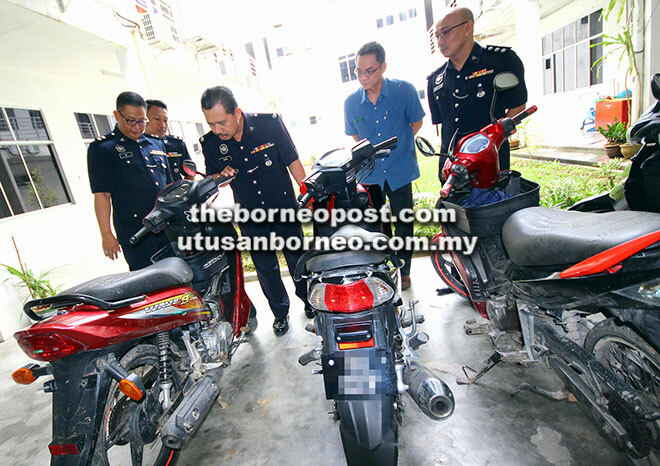 District police chief DSP Sabri Zainol said they had nabbed 14 suspects as of yesterday, following the latest arrest of a motorcycle theft gang dubbed ‘Geng IS’. He added that three members of ‘Geng IS’ arrested included their leader who is a local man and two foreigners all in their 30’s, and police had also recovered four motorcycles. He informed reporters this in a press conference at Bau police district headquarters yesterday. He said upon arrival of the police, all three suspects took off but the raiding party was able to capture one of them while the two other suspects disappeared into a jungle but were caught the following day (Tuesday) at 6am when they tried to enter a van. Further investigation led to the recovery of another motorcycle, he added. Initial investigations revealed that this gang targeted motorcycles in areas such as Kuching and Padawan. Sabri said they also had special tools and skills in stealing motorcycles, and the gang would then hide the stolen motorcycles before they were smuggled to a neighbouring country. “However, we believe there are more suspects from this group still at large,” said Sabri, adding that all the suspects have no past criminal records. Giving a breakdown on members of the other gangs who were arrested, Sabri said two were from Geng Aley, five from Geng Endot and four members of Geng Apendi. He pointed out that nine of the 14 suspects were held under the Prevention of Crimes Act (Poca) and two of the nine suspects had been identified to be involved in ‘Geng Rantau’ (a group known to rob and tie up their victims). In this regard, Sabri urged members of the public to give their full cooperation to the police. Meanwhile, in another development, a total of 103 individuals including a 29-year-old drug trafficker have been arrested during the first six months of this year for suspected involvement in drug abuse. “Those arrested include a drug trafficker, 29 persons for drug possession and 73 persons detained for testing positive for drug taking. All suspects are being investigated under the Dangerous Drug Acts, 1952,” he said, adding that it is undeniable that students had also been arrested for drug abuse. Also present during the press conference were district CID chief ASP Benedict Faris Jimoy, district special branch chief ASP Damataries Lautin, district traffic investigation and enforcement officer Insp Mahadir and investigation officer Insp Ali Rahman.